This is part 2 of my journey to try and write a ray/path tracer in Go. Checkout part 1 here. I’m roughly following the e-book Ray Tracing in One Weekend, but translating all of the code into Go. In the previous post we covered how a path tracer works and got an image to display on the screen by blending red, green and blue into a cool looking gradient. This time around we’ll draw a sphere instead, but by actually sending rays into the scene and marking the pixels where they hit the object. This is the first major step into building a fully functional path tracer. Lets get to it. All of the code for this post can be found on my Github. In geometry, a ray is a line with a single endpoint (or point of origin) that extends infinitely in one direction. So, a ray has two parts: origin and direction. Next, we need to be able to move along our ray either forward or backward. The function to allow us to do so is defined as: p(t) = A + t * B where A is the ray origin, B is the ray direction, and t is a real number. This method takes in a t as a float64 and returns a position vector in 3D space, which is our new position on our ray. Now that we can define and move along a ray, we need to add the second piece of the puzzle, a sphere. In geometry a sphere is defined as having a center and radius. Now comes the fun part, adding the ability for a ray to determine whether or not it comes in contact with a sphere. Where p is the point, C is the center of our sphere, and R is the sphere radius. Now this is great, but we want to know if our ray p(t) = A + t * B ever hits the sphere anywhere. So basically, is there any t for which p(t) satisfies the sphere equation. Since this is quadratic, we can use the quadratic formula to solve for t. When solving the quadratic, there is the discriminant portion of the equation (b * b - 4ac) which tells us the number of solutions. Now that we can determine if our rays hit our sphere, lets add some color. 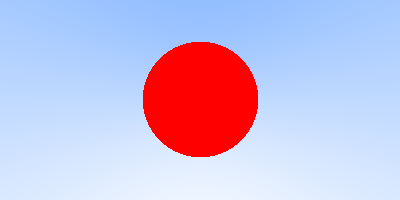 We want our image to show that when a ray does hit the sphere the pixel is marked red, and when they don’t, it shows up as a nice blue gradient. Note the jagged edges of the sphere, this is because we haven’t implemented anti-aliasing yet, so the pixel is either red or part of the background (there is no blending happening). We’re going to fix this in a later edition. Well, that’s enough for now. Next time we’ll work on shading and add another object to the scene. As always, let me know what you thought of this post on Twitter.